My wife and I recently watched The Little Mermaid II... and we both ended up falling asleep. To be fair, we were a both bit tired, but I have to believe that if the film was in any way exciting or engaging we wouldn't have ended up dozing off. I think the main issue with this film is that it's basically just a lesser copy of the original, with basically the same plot but with no heart. As we begin, we find that Princess Ariel and Prince Eric have had a baby daughter named Melody. And while the evil Ursula may be no more, her sister, Morgana, is a bit ticked at that outcome. So to vent her frustration, she tries to kidnap (or kill) the baby. Oh, and she wants King Triton's magical trident. I guess that fits in somehow. 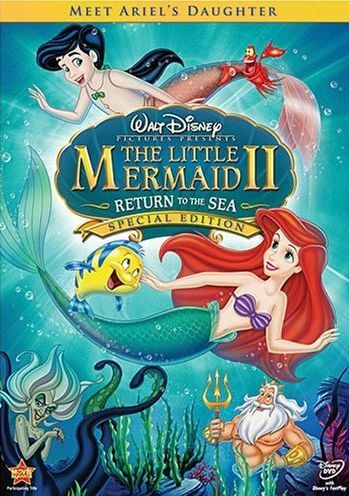 Okay, so after the attack and Ursula is defeated (but not vanquished), Ariel feels it is too dangerous for Melody to swim in the ocean or be a part of the whole mermaid culture. So a wall is erected around the castle so that Melody can still swim but be protected from the ocean. Yeah, I'm sure that'll work out just dandy! Flash forward several years, and now Melody is now twelve years old. She is supposedly clumsy and awkward, but we don't really get to see much of this. I think the main reason it's mentioned is that they needed a reason for her to be called to the sea. She loves swimming in the ocean, even though it means sneaking out to do so. And because Ariel hid the truth from her, she has no idea what kind of danger she is in. So one day Melody finds this necklace at the sea bottom... and it has her name on it. Weird! But I know where it came from... after the attack when Melody was a baby, King Triton decided to just drop the thing in the ocean. I thought it was an extremely strange decision at the time, as why wouldn't you want to keep a memento of your granddaughter... or just give it to her. It made no sense. But when she finds it, somehow Morgana is able to see Melody in her magic viewing thingy. Well, now Morgana knows where Melody is. Of course, it won't do her much good until Melody actually travels out into the ocean. Any guesses on how long that'll take? So the two hook up, and Morgana turns Melody into a mermaid. But then says it is only temporary, because her magic trident, which could make it permanent, was stolen by an evil dude named King Triton. On her way to retrieve the trident, Melody encounters the requisite sidekicks. In this film, it's a penguin and a walrus. These guys want to be heroes, which is difficult for them since their cowards. Wanna guess how that ends up working out? Yeah, VERY predictable. Other characters from the original show up, like Sebastion and Flounder, but they don't really play a major role. And Flounder is shockingly grown up. I mean, of course he would be, but it was just a shock to see and hear him now. Like the original, there are musical numbers scattered throughout. Unlike the original, they are not special or memorable. And a few of them feel kinda forced. I doubt kids will notice that, though. And actually, I'm sure young kids will enjoy this movie just fine. But as for adults... well, it just doesn't live up to the original. The extra features on the Special Edition are fairly weak as well. There is one deleted song, an musical animated short from like the 1930s or 40s with absolutely no dialog called Merbabies, a storybook that you can read or have read to you, and some games. I'd say it's hardly enough special features to consider it a special edition release. But since it was already released, I guess they had to call it something.